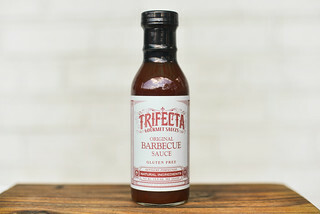 Lacking the complexity of more traditional barbecue sauces, the sweet mango base is a nice flavor that just doesn't live up to its full potential, ending with a sauce that's one note and more akin to jam or jelly. 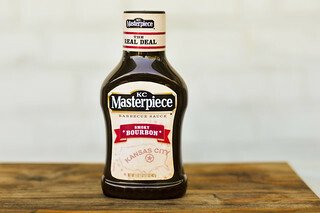 Ron Slawek started out his barbecue sauces as many do, a backyard chef who's sauce got the nudge from friends and family to perfect and bottle. What Ron has most other don't, is an endearing story on the origin of the name—after a downing and beer and burger on a business trip in Arizona, he spotted a pig in the hotel parking lot and decided to go after it, only to later become the one the being chased, hence "Pigchaser." 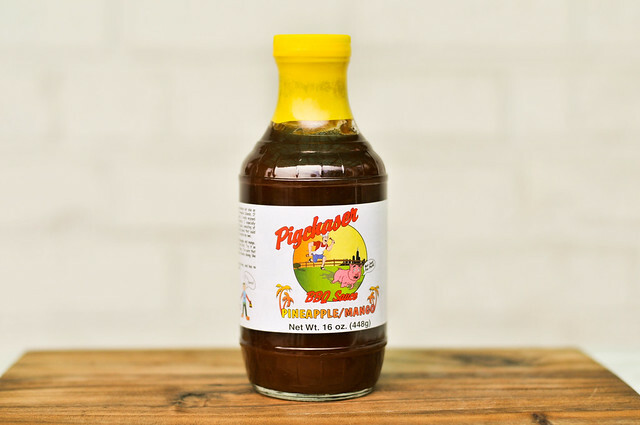 Since officially launching Pigchaser in 2007, he's worked to develop a line of five unique sauce—this pineapple/mango recipe being reminiscent of fruit sauces Ron had in Hawaii. A big whiff of this sauce fills the nose with the sweet smells of mango and honey. A slight vinegar tang tries to creep in, but it's mainly just the sugary fruit aroma that comes through, with no detectable heat. The brownish-orange sauce weighs in at a medium thickness, with a jelly-like consistency that shows very little spices, but some nice chunks of fruit. Staying true to its gelatinous looks, the sauce clings heavily to a suspended spoon, falling in globs as gravity takes its toll. If you have a sweet tooth, this sauce might be right up your ally. Sugar is the name of the game here, with honey being the dominante trait, mixing well with the next in line, mango. Beyond that there's faint notes of tomato and vinegar, as well as pineapple, which blends in more than the mango. 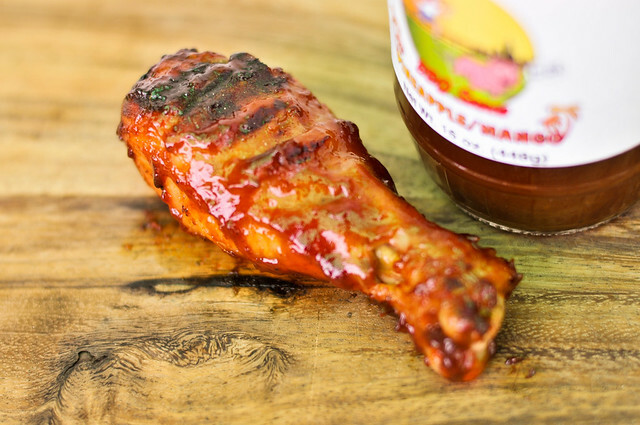 The sauce has a jelly-like consistency that's more reminiscent of jam than a traditional barbecue sauce. The sauce coated the chicken just fine, but after baking in slightly over indirect heat, it burned over the more intense direct heat. Unfortunately the sugary fruit flavors out the jar were diminished after being cooked—the finished chicken has a faint fruitiness that was pretty one-note. With not much flavor the speak of, the little brunt spots tasted burnt, and the sticky fingers the sauce left seemed more of a nuisance than invitation for licking. In terms of flavor, there's nothing really off with this sauce, it just doesn't fully deliver. 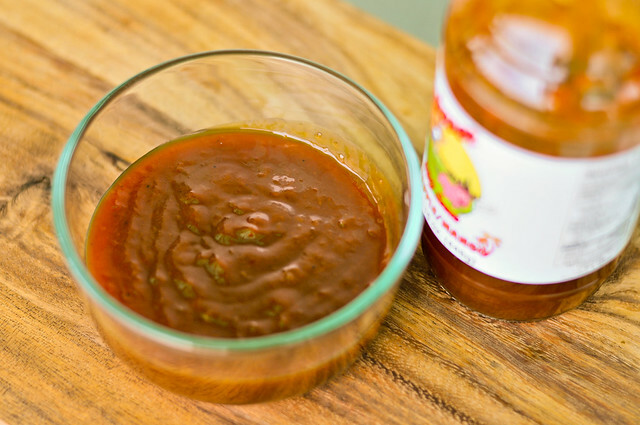 More akin to a jam or jelly, the sweet mango base never gets off the ground into the more complex layers of flavor I think defines a great barbecue sauce. 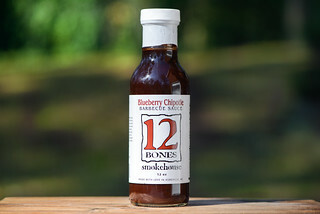 The bottle states its good as a dip for fish or chicken, which is probably the best use of the sauce, as its fruitiness will come come through against the lighter flavors of those meats, while it'd probably become completely lost on the likes of briskets or smoked ribs. I've read nothing but good things about Pigchaser, and while this particular sauce didn't quite live up to those expectations, I'm looking forward to trying out more, as each sauce seems to be its own unique recipe, holding future promise.